What I love the most about Malta – besides the wonderful people around us – is the sea. I can sit on one of the rocky beaches for hours staring at the sparkling shades of blue, the salty air in my nose and the the next seafood meal on my mind. 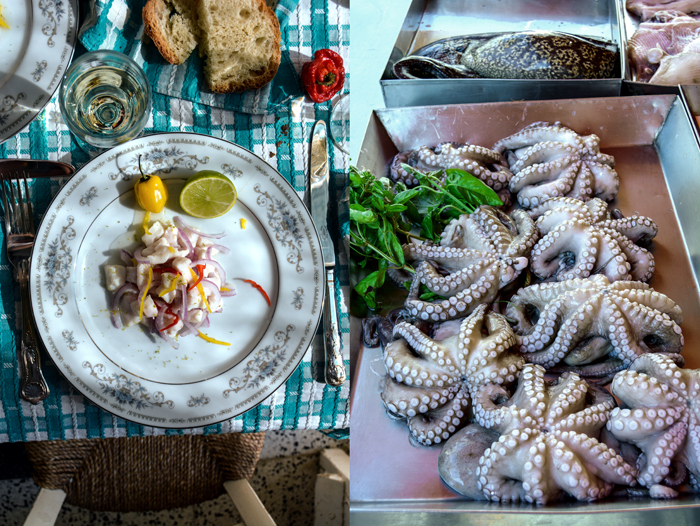 Although I’m quite obsessed with snorkeling – I feel a great fascination for the beautiful wonders of Malta’s amazing underwater life, I can’t help but think about food when I’m close to the sea. 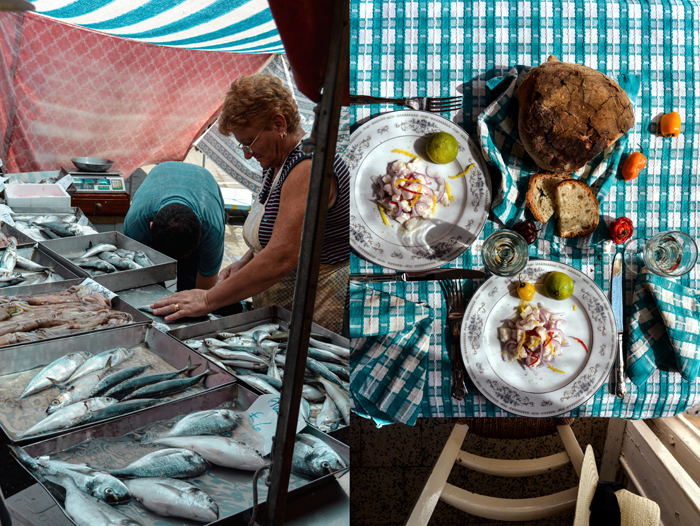 We went to the fish market in Marsaxlokk as soon as we arrived and I couldn’t resist filling the cooling box with the freshest tuna, swordfish, calamari, Cipullazza (scorpion fish) and sea bream. The fisherman’s wife at one of the stands made us try a selection of raw fish as I was on a mission. 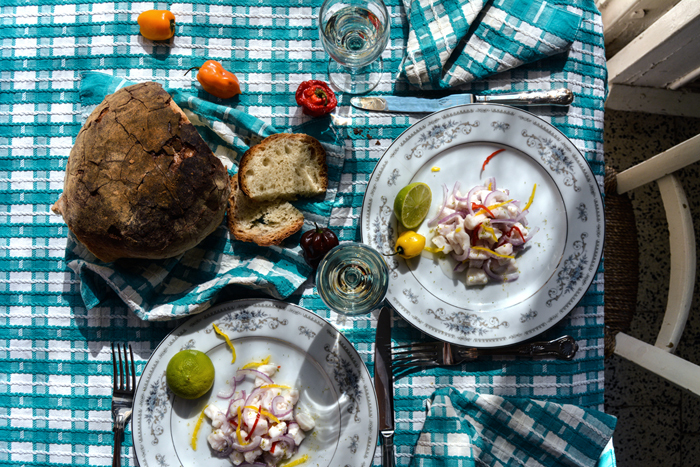 I’ve been wanting to make Peruvian ceviche for months and I decided that there’s no better place for my culinary experiment than Malta with its daily catches from the sea. 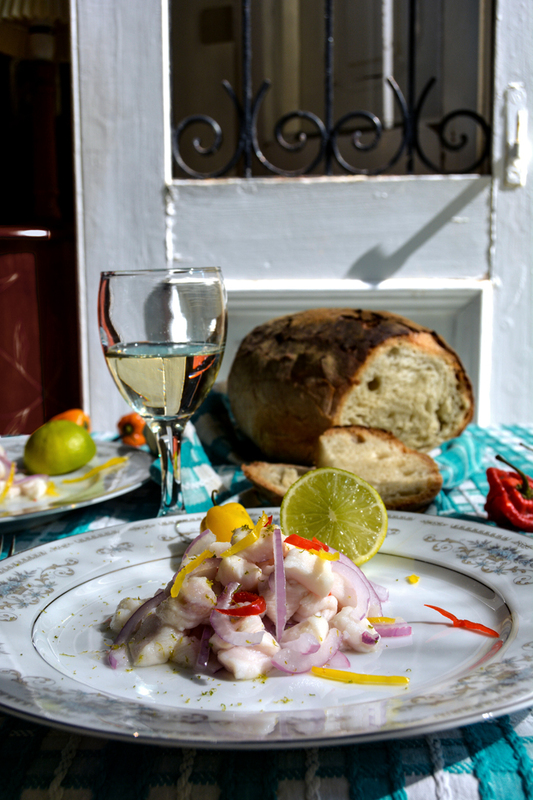 Ceviche is a traditional Peruvian dish made with raw fish marinated in lime juice for a few minutes. Although the citrus fruit’s acid creates a chemical process similar to cooking I still wanted to use the freshest fish possible. I also felt that it would be appropriate to taste it raw first to approve the taste of my choice of fish. 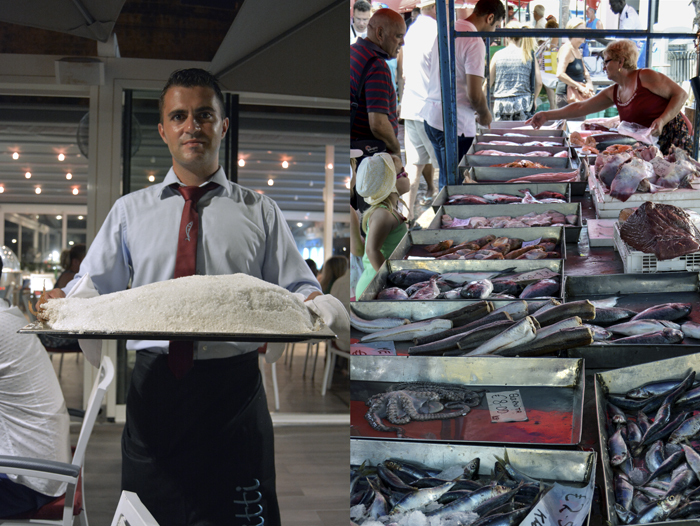 So we were right in the middle of the market, surrounded by lots of people and the most beautiful seafood offered on large tables when my experiment started. I just thought of sushi when I put one thin slice of fish after the other into my mouth. It felt a bit strange, especially after my fish-stand-lady told me that she would never eat raw fish. She had a mischievous smile on her face, but I trusted and survived. I’ve never been to Peru so I decided to ask a woman for help who has lived in Lima for years, she’s a passionate connoisseur and food writer. I met Sheila through eat in my kitchen, she is one of my blog’s earliest readers and joined me on this journey with great support. We’ve never met in person but we felt a connection immediately through the universal language of food. My Peruvian lady is originally from Chicago but she dug deeply into her new home’s kitchen culture. 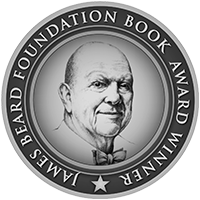 I knew that I was in the right hands when I asked her for a recipe – and I wasn’t mistaken. 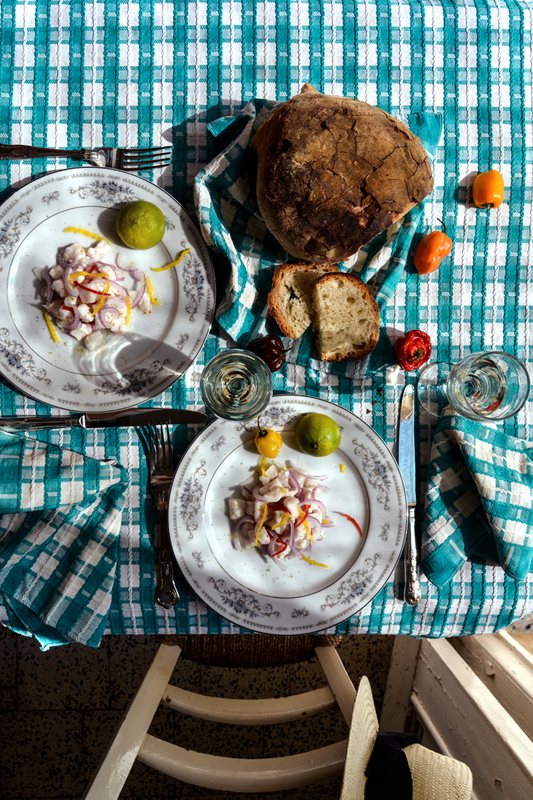 Her directions led to the most delicious ceviche on our table in Malta, it was surprisingly quick and easy. And yes, lime juice kind of cooks the fish, I couldn’t believe it when I saw (and tasted) it! Sheila recommended flounder but I went for Accola (Maltese amberjack) which was my favourite at my raw fish tasting session. I also added some lime zest which isn’t usually done in Peru but I love the slightly flowery flavour it adds to the fish. It was quite an exciting kitchen experience but most importantly: my new seafood discovery made the most delicious lunch! We also had a couple visitors to the island in the past few weeks. My mother decided to hop over for a spontaneous long weekend which we celebrated befittingly. 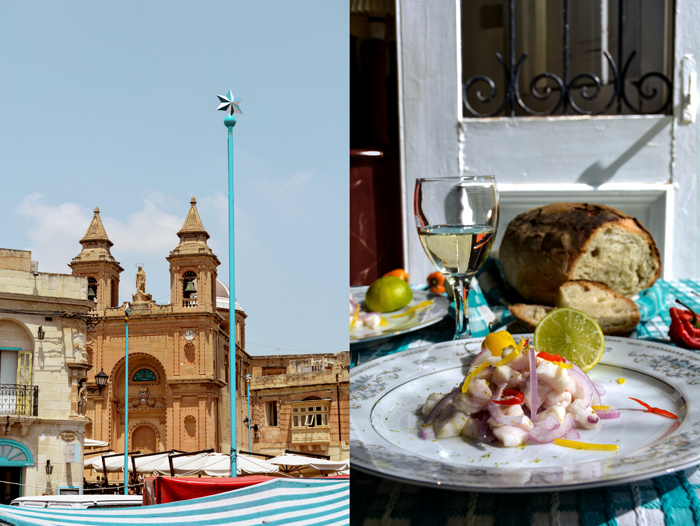 We enjoyed a Maltese champagne picnic with the fantastic Cassar de Malte at a promenade in Valletta before we headed over to a new restaurant find – the Italian Scoglitti right at the sea. They treated us to a huge local Pagell (red snapper) in sea salt crust after we had already enjoyed octopus with potatoes, swordfish carpaccio and pulpetti tal-Makku (white bait pulpetti) along with Meridiana‘s white Isis wine. It was a feast finished with Maltese Mqaret (date sweets) – the delicious recipe will follow soon! 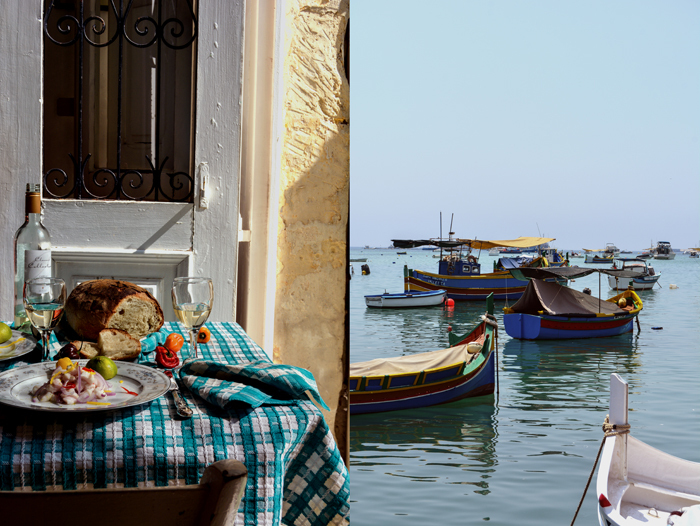 Another one of my most beloved seafood restaurants on the islands is Rew Rew at Mgarr ix-Xini in Gozo. 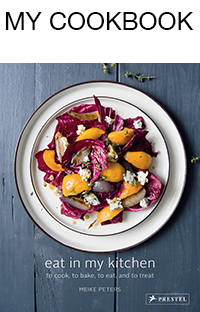 Noel creates very pure dishes, honest simplicity, always cooked to perfection. 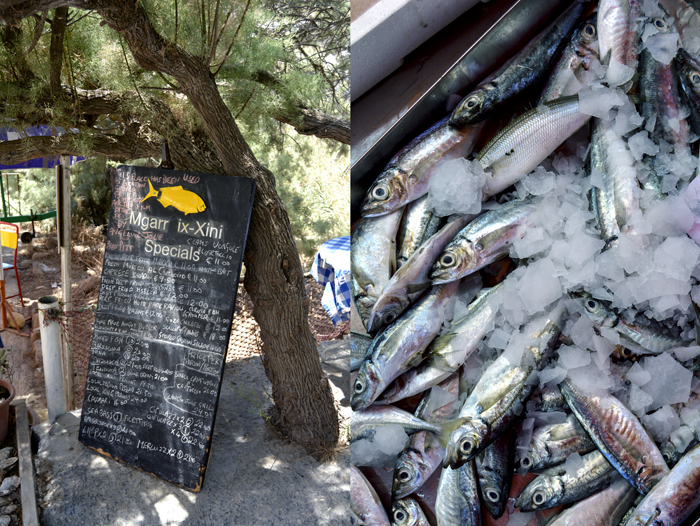 We went to the little hidden bay a couple times this summer to enjoy local prawns from the BBQ, fried sardines and makku, grouper ravioli and Bazooka (deep sea snapper). Holly, my editor from New York, joined us on one of these visits and she was more than impressed. I love the sea and all these wonderful frutti di mare, it’s a gem we have to protect and treat with respect! Cut the fish into 1cm / 1/2″ pieces. Lay the fish in a large sieve, rinse quickly with cold water, drain and dry with kitchen paper. Pour the lime juice in a deep bowl, add the fish, toss it around and marinate for 2 1/2 minutes. Take the fish out with a slotted ladle and divide between plates. Garnish with onion and aji límo and sprinkle with salt and lime zest (optionally) to taste. 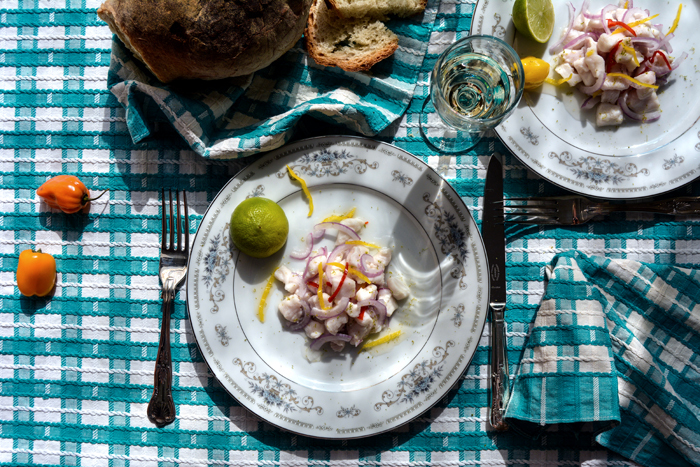 You can serve ceviche with cooked corn, sweet potatoes and lettuce.